Wildcat 1000 Cab Back / Dust Stopper Fits: 2012-2015 Wildcat 1000 (2-seat model) WILL NOT FIT: 4-Seat model or Wildcat Trail Fast straps allow you to remove it in seconds. Rubber Straps will not rust or scratch your cage. Edge Trim along the lower edge seals and protects your plastic. Works with most tops. Made from 3/16" thick Lexan (Polycarbonate), making it virtually unbreakable. Not cheap acrylic like others on the market. 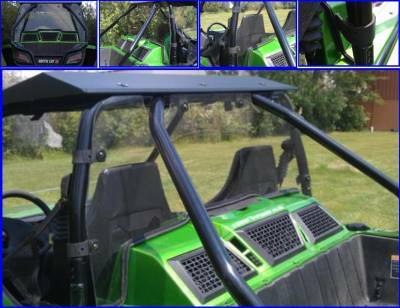 Keep the dust and water off your back with this Polycarbonate rear window. Attaches in seconds with our Patent Pending Rubber "Fast Straps". Simply wrap them around the tube and fasten to the plastic pins.